It came to my attention through an internet article that a perigee moon and full moon would coincide ( “supermoon” ) and be visible on Saturday evening, May 5, 2012. After some research, it seemed that the moon-rise would be visible on the eastern horizon just after sunset. The photograph shown below is a composite of two images from the set of 114 images that were recorded. The first of the two was exposed for the ambient light of the background objects and the second of the two was exposed for the much brighter moon. 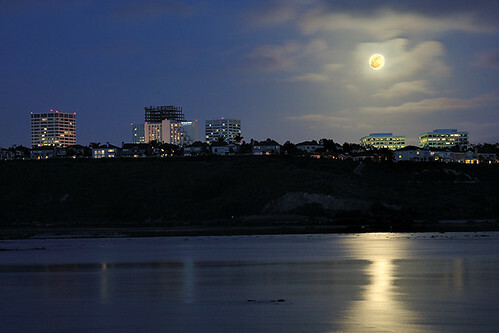 Since the moon was moving and the time between exposures was several seconds, the image of the moon had to be repositioned in Photoshop to precisely align with the moon position in the background image. I am open to suggestions for improving the above image. Please leave your comments below.